Senior Fellow, International Centre for Trade and Sustainable Development (ICTSD); Regular panelist, World Trade Organization (WTO) dispute settlement system. 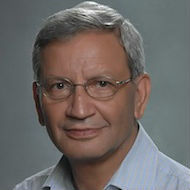 Former: Director of the Liaison Office, United Nations Food and Agriculture Organization; Ambassador and Permanent Representative of Pakistan to the WTO; Chair, WTO Council for Trade-Related Intellectual Property Rights (TRIPS); Chair, WTO Balance of Payments Restriction Committee; Independent consultant on international trade and food security issues from Geneva and Islamabad. Has published several papers in international and local journals on issues relating to international trade and is frequently invited to make presentations at international conferences, academic institutes and other influential forums. PhD, University of Hull (UK); MSc, University of Peshawar.